Ross Parkhill, from Ireland, is the 7th Gold Ring winner at this year’s Aussie Millions Championships after he defeated Michal Polchlopek in a very short heads-up battle and claimed the $1,500 No-Limit Hold’em Bounties tournament. A long battle was expected as both players had similar stacks that were around 65 big blinds deep. One thing that was going to end it quickly was a cooler, and that’s what we got. Parkhill flopped a set and rivered a full-house on the paired river that also made trips for his opponent. Parkhill managed to find a check on the turn and that helped the chips to go in much easier on the river. He takes home a whopping $119,500 AUD to Ireland and Polchlopek had to settle for second fiddle and a cheque for $73,000 AUD. 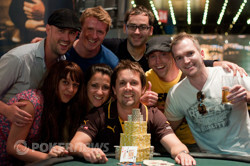 The final eight players came together with an average stack of 50 big blinds so there was a lot of play to be had. Not so for the short-stacked James Obst. He got his chips in good versus Mark Betts but could only watch on as his opponent made two-pair to eliminate him. Adam Cusenza followed in 7th after he got the last of his chips in with a dominated ace versus Sam Capra. Oliver Speidel was caught bluffing by Betts in a pot and from there-on things didn’t go well for him. He got short, pushed with , and ran into Polchlopek’s in the big blind to bust. Jamie Pickering was the next out of the door. The first phase of the day went well for him, but he never seemed to find his stride once he reached the final table. He was busted by Betts after trying to bluff all-in with jack high, called by his opponent with pocket threes. There was a plateau in play at this point as the chips were traded from one player to another. Betts was the next to crack after he called a Polchlopek raise whilst in the big blind and went on to check-raise in to his opponent’s full-house. He was called down and shown what he was up against, and mucked to leave himself with just 14,000 chips. He busted the next hand. It wasn’t too long before the tournament reached heads-up. Capra committed the last of his chips with an open-ended straight draw, but he ran into Parkhill’s trips and failed to catch-up. Overall this tournament was great value for the $1.500 AUD entry fee. A great structure with bounties and different formats kept everyone fresh through the long hours it took for 315 players to become one. The end of the tournament all started when Michal Polchlopek had the button and opened the pot. Ross Parkhill made the call and some cards were laid out on the felt. On the flop, Parkhill put in the check-raise, making it 140,000 after Polchlopek led for 55,000. A call from Polchlopek and the hit the turn. Both players checked this card and the was dealt on the river. this time Parkhill led, sliding out 250,000. Polchlopek then popped it to 600,000, at which point Parkhill moved all in. Polchlopek looked in pain as he contemplated the decision. He knew the chip counts were close and eventually made the call. A full house for Parkhill was enough of a hand to take down Polchlopek's trips. When the chips were officially counted out, Polchlopek was left with only 151,000, while Parkhill had almost 3,000,000. Polchlopek didn't have much of a leg to stand on and the very next hand shoved his stack all in holding . Parkhill made the call with . The flop housed a and it was all over. Polchlopek goes home with $73,000 for his great effort, and with that, we have a champion! Here is how the final two players stack up in the bounties event. There came a time when Sam Capra had to stop folding and stick his chips in the middle. Unfortunately for him, he did it when an opponent had flopped trips. Capra raised to 55,000 from the button and both his opponents called from the blinds. The flop came down and Capra shoved for his remaining 290,000 when the action was on him. Michal Polchlopek folded from the small blind but Ross Parkhill called from the big blind. Carpra: for an open-ended straight draw. The board ran out to see Parkhill's hand hold. The players are taking a ten minute break before they begin their heads-up battle. We be back then and verify their chip counts. Play has been very slow during the final three here in the bounties event. Michal Polchlopek still has control, with Ross Parkhill not far behind. There has not been a showdown a long time and the last several hands has seen no flops being dealt. Michal Polchlopek, as we've written before today, is the most aggressive player on show. The fewer players there are, the more it plays into his hands. I's been all him since three-handed play began. He's raised every hand, three-bet a bunch, and the the most hands all without showing down once. This has enabled him to add 400,000 to his stack with little effort. The other two better up their aggression levels or he'll have a very big chip lead come heads-up play.